We Be Reading: "Animals move in different ways." "Animals move in different ways." A few years ago we took Z to Toys R Us and, for the first time, he picked out a book all on his own. This was Tails by Matthew Van Fleet. It is an adorable book that appeals to the youngest of toddlers because of the textures and flaps in the book. The animals are well-drawn and very cute. It has long staying power too as the kids learn some of the vocabulary of the book like "spiny" and "broad". After a while, though, we wanted something a bit more advanced. Move!. 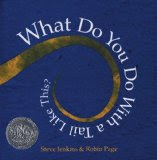 This book is also by Steve Jenkins and Robin Page and has the same type of torn-paper illustrations. It gives an animal example for over a dozen types of movement. I think that it's great for a preschooler who is discovering their own body and their ability to move in different ways. After all, who doesn't want to try to "slither" when they hear that word? This is how we find some of our kid books. We take something that we know Z already loves and then look for an older equivalent or a similar book about a different topic. And it never hurts to just pull your toddler's stroller up to the bookshelf and see what catches his or her eye. Buy Tails , What Do You Do With a Tail Like This? and Move! on Amazon or find them at your local library.